Welcome back to Seed of the Week! Our mystery seeds from two weeks ago were indeed from the common garden flower bachelor's buttons, Centaurea cyanus. They may also be called cornflowers, although other kinds of plants may share that name. 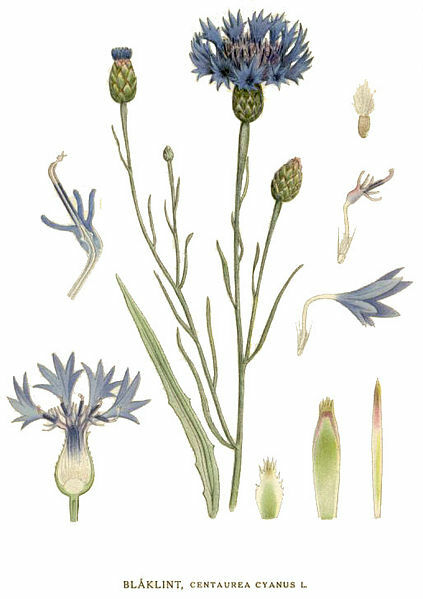 Bachelor's buttons were originally from Europe. They have been grown as an annual garden flower throughout the world and have naturalized in parts of North America and Australia. Ironically, the plant is declining in the wild in Europe. The flowers are commonly a lovely blue, although other shades are possible. Have you ever grown bachelor's buttons in your garden?